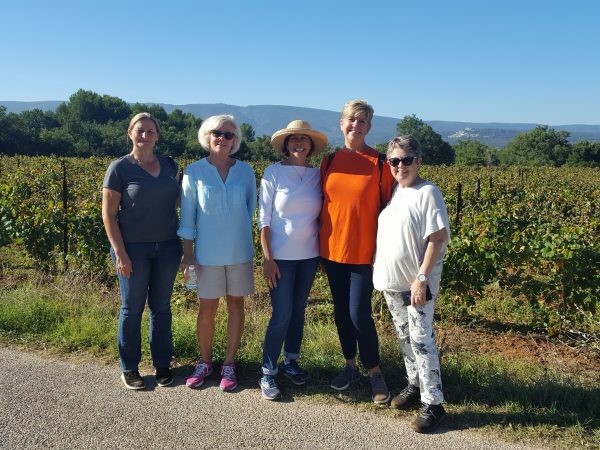 We just returned from three glorious weeks in the Luberon region of Provence, France, highlighted by wonderful groups of enthusiastic and compatible travelers and perhaps the best weather we’ve enjoyed in 13 years of hosting small group tours in Provence. 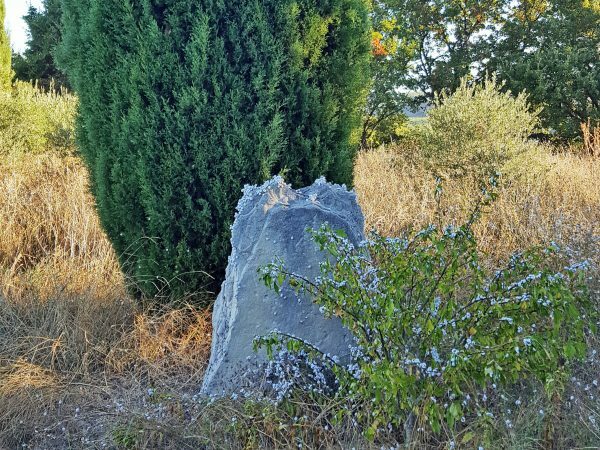 It was an ideal time to be outdoors enjoying the countryside… and a great time of year to walk in the Luberon. Charley and I have been walking in Europe for almost 20 years. 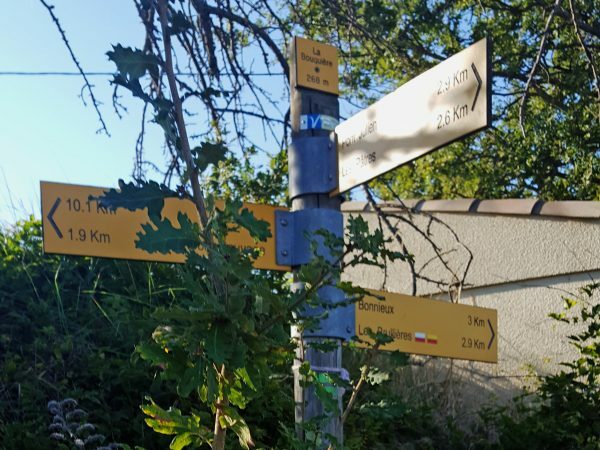 I love experiencing Europe on foot, and most of our European Experiences trips include an option for at least one walk of one to four miles. (We always have another activity for those who prefer not to walk.) I blogged last year about a special walk on our Cotswolds Experience week, a four-mile walk along the Cotswolds Way from Broadway Tower to Chipping Campden. 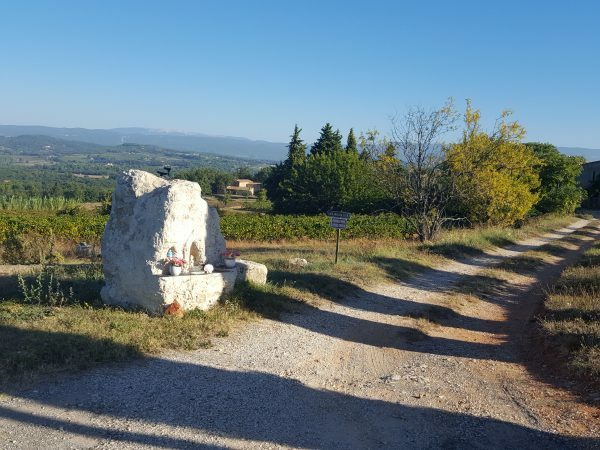 Like the Cotswolds, the Luberon is an outstanding area for walking, with an extensive and accessible network of marked walking paths and trails. The countryside is absolutely beautiful with incredible, often unexpected variety. 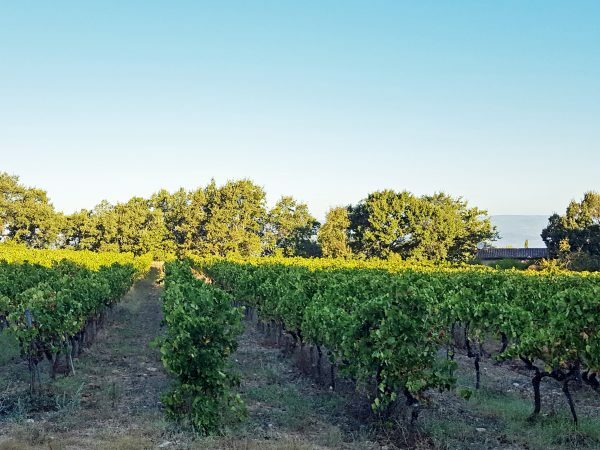 Walking paths pass through farms, vineyards, orchards and woods, past beautifully-restored homes and simple farm dwellings, up on the mountains, through the gorges, and alongside massive cliffs. These footpaths (“sentiers” in French) may be dirt paths, paved tracks, farm roads, and occasionally very-brief stretches on main roads. There’s an accepted right-of-way through private property, offering a view of local life not visible when traveling much more quickly by car. I enjoy seeing the countryside in slow motion and the small details that can be spotted along the way. 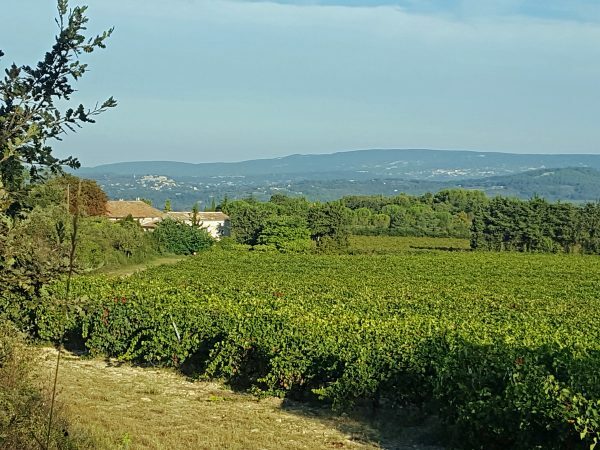 During our years in the Luberon, we’ve walked hundreds of miles in the countryside. 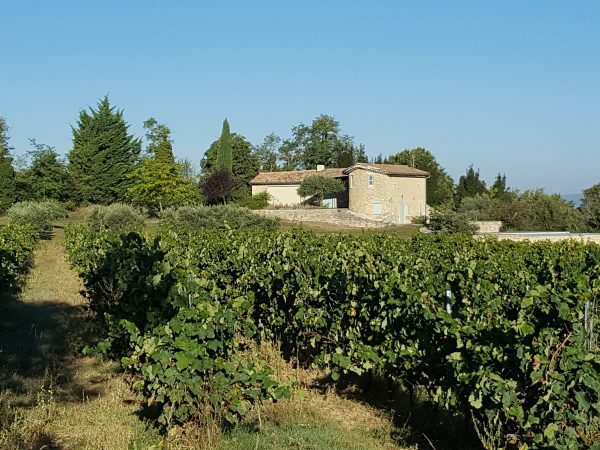 So of course our Luberon Experience week includes several options for walks: a walk from our village of Bonnieux to Lacoste; a walk on the Petit Luberon mountain through the peaceful Forêt des Cèdres (Cedar Forest); and sometimes a more strenuous walk up into the ruins of the ancient Fort de Buoux. 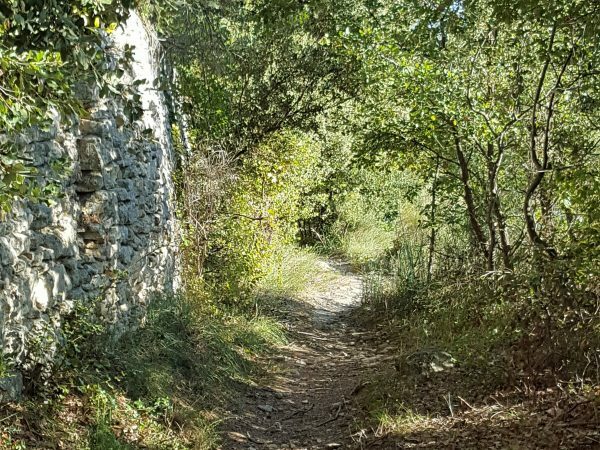 This fall I wanted to re-visit a walk we plan to include in the exciting new tour we’re offering in September 2019: the Luberon Walking Week. 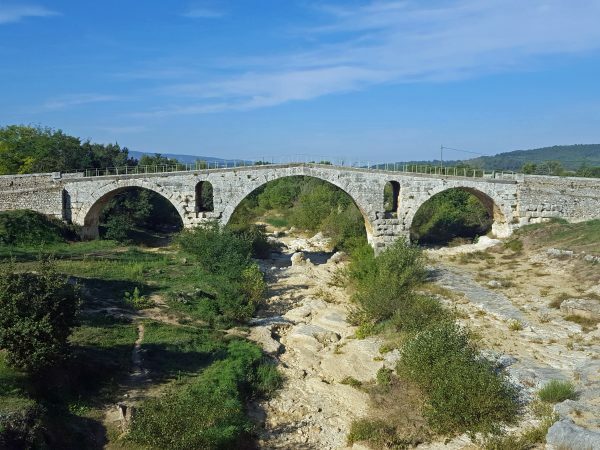 I’d done this walk just once before– back in March 2017– from our perched village of Bonnieux to the Pont Julien, a 2000-year-old Roman bridge in the Calavon valley. It’s a walk of 3.6 miles… pretty much downhill the entire way. 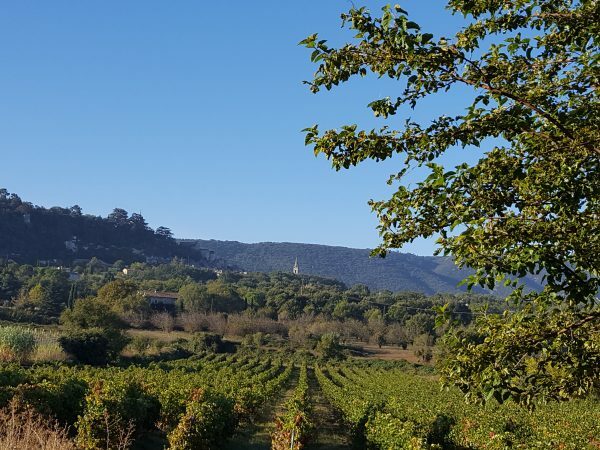 After a busy week, our Luberon Experience groups spend Friday mornings in our “home” village of Bonnieux… a relaxing time to enjoy the village and its fun weekly market. I decided to do this walk during our second week and invited anyone interested to join me. Three men in the group accepted the invitation. 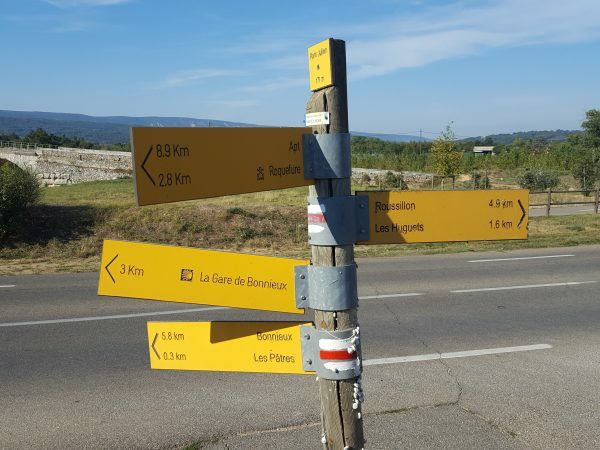 I decided to walk to the bridge on the “Grande Randonnée” (GR) trail, part of a network of long-distance footpaths covering over 35,000 miles in France. GR trails are marked with white and red slashes. So for this walk I didn’t need a map or directions… simply attentiveness to spotting the blazes along the way, especially when there was a choice of which way to go. The painted marks can be on stone walls, trees, rocks, sides of buildings, electric poles… sometimes very visible but sometimes faded or covered by brush. They can be easy to miss, and it’s important to watch carefully. 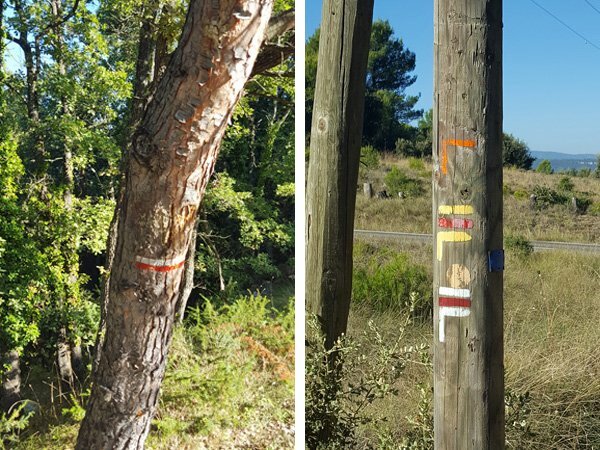 The marks on the tree in the photo on the left below indicates simply that the trail continues along the same route, reassurance that you’re going the right way. The trail marks shown in the right photo indicate that the red and white trail turns right on the road just ahead. If you see a big “X” in your color along a path, that means you’re on the wrong path… go back to the last intersection! Since I wanted to get everyone back to Bonnieux to enjoy part of the Friday morning market, this walk didn’t involve the long walk back uphill to Bonnieux. Charley met us at the bridge with his minivan and drove us back up to the village. 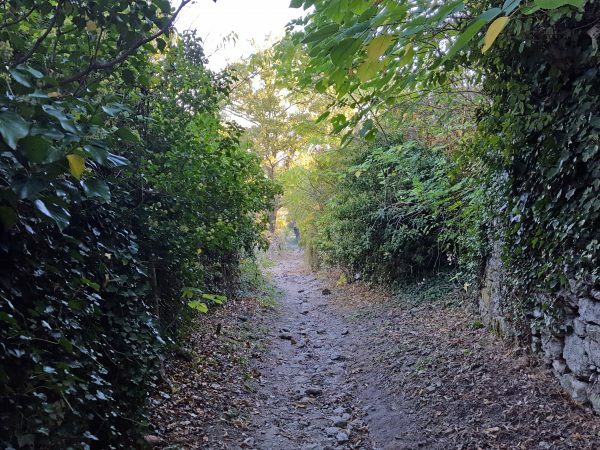 However, for walkers with more time and no transportation to meet you at the bridge, you can walk back up to the village on a paved farm road, the Chemin du Four. We began the walk at 8:45 am, and both groups arrived at the bridge at 10:30, so the walk took just under two hours with a few stops along the way. Once back in Bonnieux, everyone still had time to take a quick shower and enjoy the market before leaving for our special lunch at noon. The walk began in the lower village of Bonnieux. On Friday morning we passed by the vendors setting up their market stalls around the traffic circle and the “new” church. Our route took us down through the countryside seen in the upper right corner of the photo below. There was a yellow trail sign just past the Gendarmerie, where a rocky trail headed downhill. 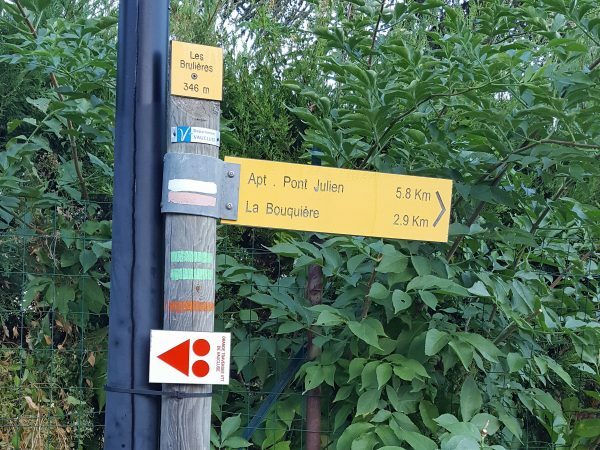 We began at an elevation of 346 meters (1135 feet) and the Pont Julien, where we found another trail sign, is 5.8 kilometers (3.6 miles). We passed an intermediate trail sign at a place called La Bouquière, at basically the half-way point. The different colored slashes indicate several different trails take this route, but we were interested in the red and white marks. Less than two minutes after leaving the village, we passed alongside a vineyard. And then continued downhill on a rough trail. 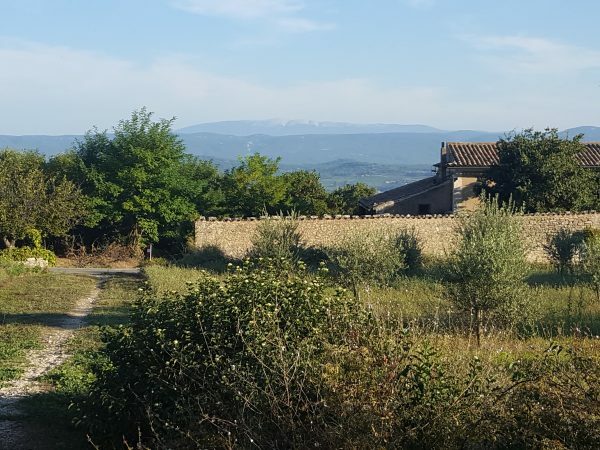 Soon we came to an attractive house with views of Mont Ventoux in the distance. One of the mysteries of the countryside we encountered this autumn. From a distance they look like flowers, but they’re tiny white snails… millions of them… clinging to surfaces, searching out moisture everywhere. We passed by several beautiful fields of lavender. 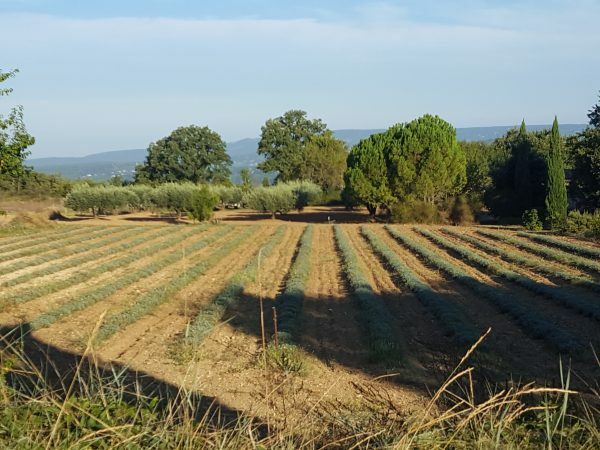 The lavender is harvested in late July/early August. 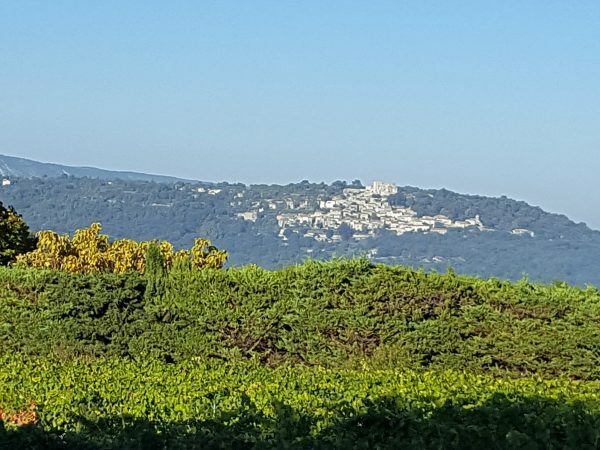 Beyond the field of grapevines, we spotted the hilltop villages of Goult and Gordes in the distance. There are some beautiful restored homes tucked away in the countryside. We liked this one. 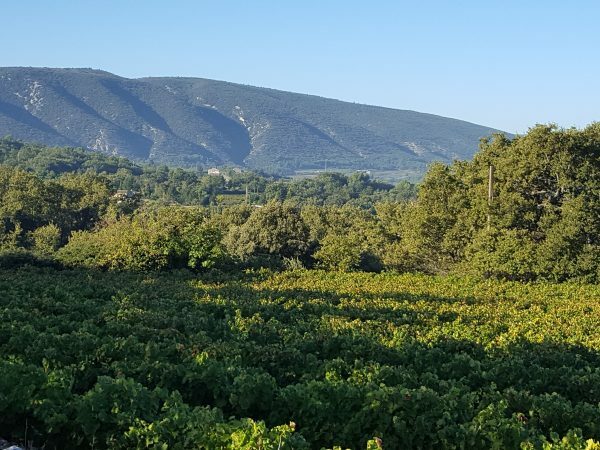 Looking back at Bonnieux and the Petit Luberon mountain with hints of autumn in the vineyard. That’s the steeple of the lower church where we began our walk. And then across the valley, the village of Lacoste. Another view up to the Petit Luberon mountain, so clear on both mornings. A lovely stretch of trail through the woods. More hints of autumn color, this time in the cherry trees. These trees are filled with white blossoms in early April, and the cherries are usually harvested in mid-May. It was a beautiful morning for a walk. The signpost at La Bouquière was partially hidden in the brush. We turned left on a small road toward the Pont Julien. Halfway there! An interesting shrine at the entrance to a house. Notice the change in the soil… as we approached the river valley, we began to see ocre in the soil. Another attractive stone house– with a lovely terrace and swimming pool. And later along this narrow country road, some beautiful trees. I always enjoy the camaraderie with fellow walkers. It’s fun to share the experience, and we have some great conversations along the way. 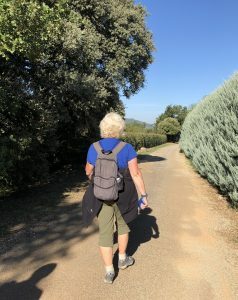 At the end of this walk, we were refreshed and invigorated… it was an excellent way to start our last full day in the Luberon. 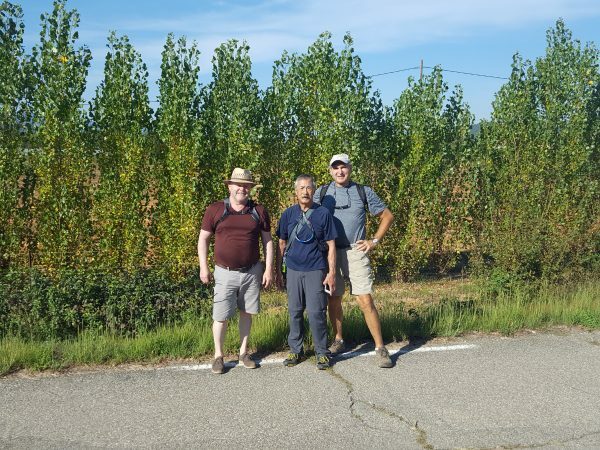 Thanks so much to my walking companions for these two walks: Keith from Colorado and Steve and Dave from California; and Jackie from Pennsylvania, Kathy and Joyce from Georgia, Kim from Florida, and Catherine from Western Australia. 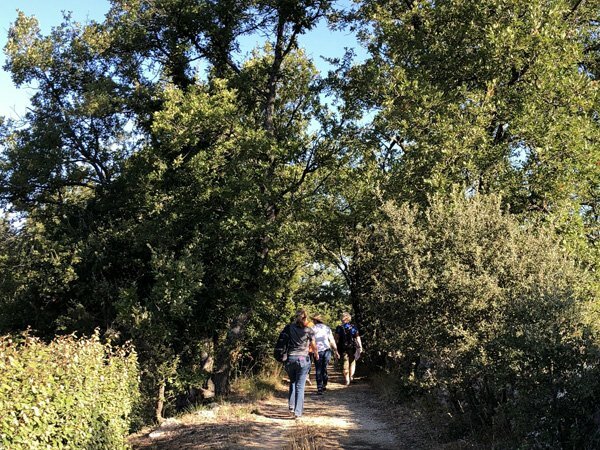 We’re looking forward to sharing this walk and other favorite walks on our special Luberon Walking Week, September 14 – 21, 2019. 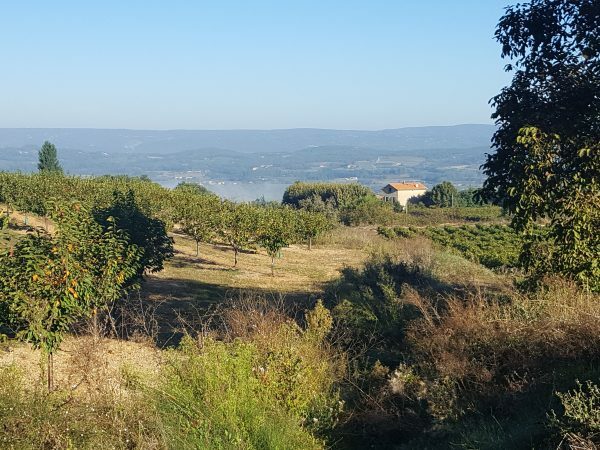 Join us to experience the Luberon on foot… get great exercise in beautiful surroundings and then enjoy the wonderful food, wine, and laidback lifestyle of Provence. 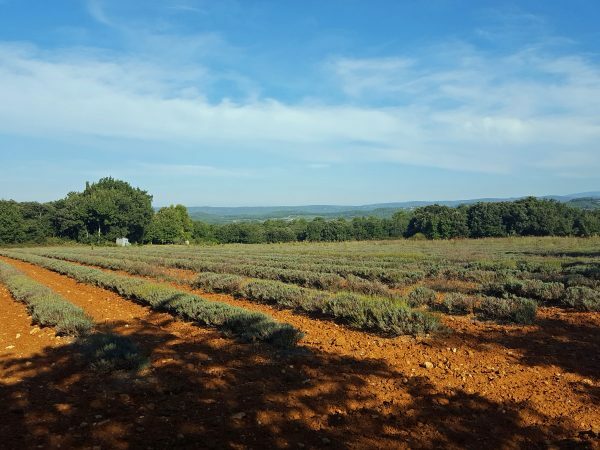 Kathy Wood and her husband Charley lead European Experiences, week-long “slow tours” in some of the most beautiful areas of Europe, including The Luberon Experience in Provence, France. 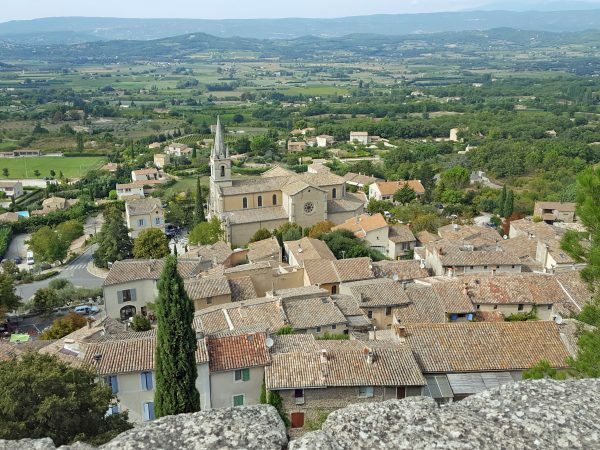 National Geographic Traveler magazine named The Luberon Experience one of their "Tours of a Lifetime" for 2012, the top 50 tours in the world. Kathy and Charley host Experience weeks in the Luberon, the Chianti region of Tuscany, Alsace, the Dordogne, and the Cotswolds. They also offer two longer trips: The European Christmas Experience (12 days) and The Cornwall Experience in southwest England (10 days). 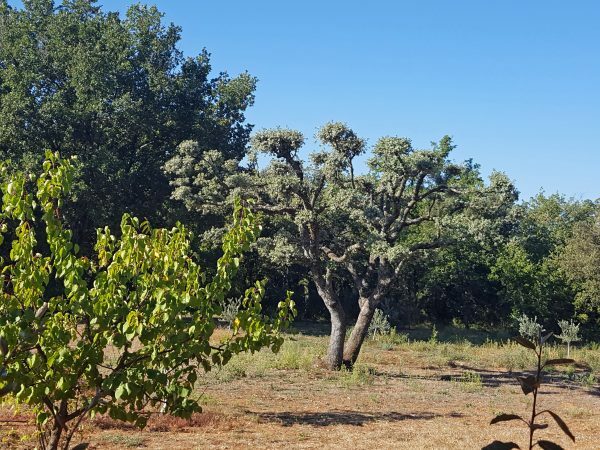 They're excited to offer The Luberon Walking Week for the first time in September 2019. 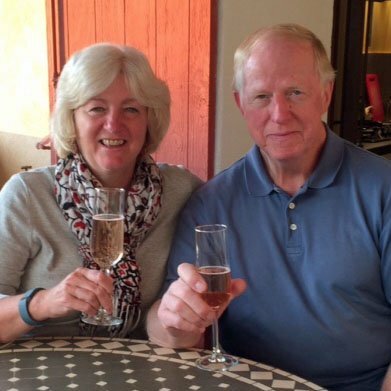 Kathy and Charley have been traveling in Europe for over 25 years and love sharing their special places in Europe with other travelers. They've hosted 100+ Experience groups since they launched in 2006. 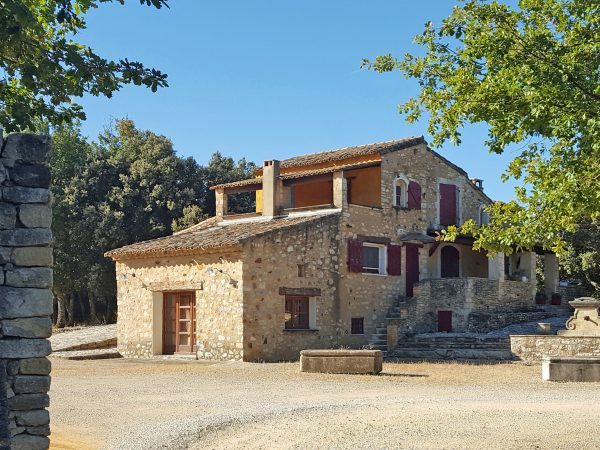 They now live part-time in their beloved village of Bonnieux in the Luberon. Read more about Kathy and Charley here.